Fox White Nationalist Tucker Carlson’s biggest worry about the slaughter last week in New Zealand– by a confessed Trump supporter– was worry that social media might curtail “free speech” by blocking further broadcasting of live gun massacres. 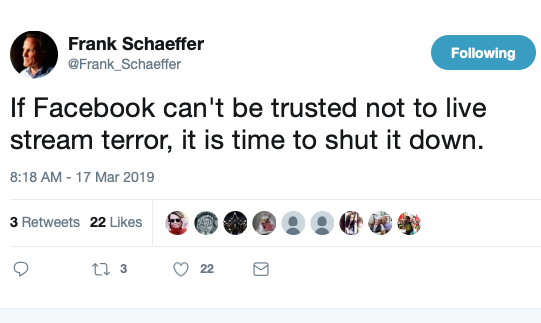 Facebook can’t seem to figure out how to prevent the live streaming of mass murders, another in a long list of problems for the tech giant, problems that are rankling the public and bringing the industry front and center politically. Nancy Scola did a piece for Politico Sunday asking how the Democrats running for president turned against tech— a big change for the party. Scola sees evidence that “Democrats running for president see big tech companies as enemies of the progressive agenda, rather than the allies they once were. Warren’s complaint last week that the social media giant ‘has too much power’ might have been a shock coming from a prominent Democrat just a few years ago, when Barack Obama’s public appearances with CEOs like Mark Zuckerberg and Twitter’s Jack Dorsey were typical for a party seeking to boost its appeal to tech-savvy young voters. The hard turn against the technology industry from prominent Democrats represents a major cultural change in the party– and a real threat to Silicon Valley’s political influence with liberals who may share tech workers’ political sensibilities but are diverging from the industry on fundamental issues about privacy, business practices and taxes. For the industry, the danger is that the next president could espouse policies harmful to tech’s bottom line, from pushing for tougher antitrust action to restricting government contracts for companies unwilling to change their ways. Klobuchar sounded the theme at the very start of her campaign, during the announcement speech in February where she stood in blowing snow in Minneapolis. “For too long the big tech companies have been telling you ‘Don’t worry! We’ve got your back!’ while your identities are being stolen and your data is mined,” the Minnesota senator said. Even Cory Booker, a Stanford grad with close ties to Silicon Valley, used a recent NPR interview to lump tech in with other powerful lobbies that need to be reined in. “We need to make sure that whether it’s Silicon Valley or the pharma industry or the big ag, we need to hold people accountable for their actions,” he said. …Warren has taken the hardest line of all, calling for the federal government to shrink and split up industry giants like Amazon, Facebook, and Google. “To restore the balance of power in our democracy, to promote competition, and to ensure that the next generation of technology innovation is as vibrant as the last, it’s time to break up our biggest tech companies,” she wrote in a blog post this month. • Nearly 90% of all internet searches now go through Google. • Amazon is now the first stop for a third of all American consumers seeking to buy anything. 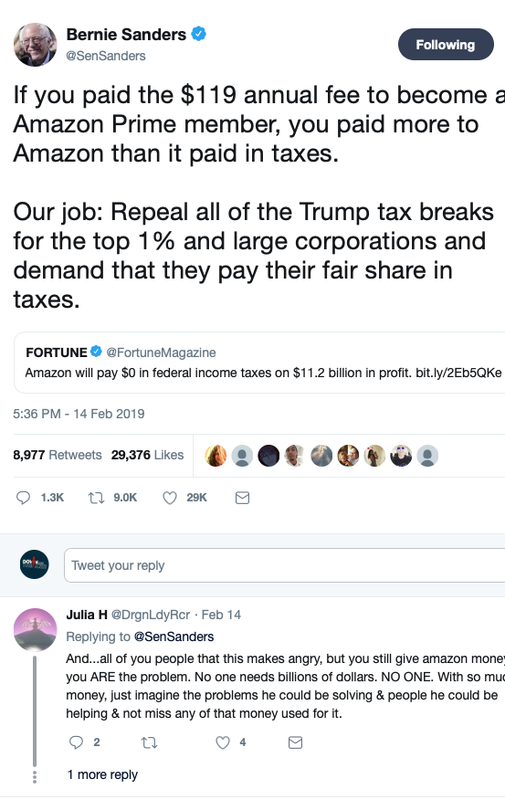 Amazon– the richest corporation in America– paid nothing in federal taxes last year. Meanwhile, it’s holding an auction to extort billions from states and cities eager to have its second headquarters. It also forced Seattle, it’s home headquarters, to back down on a plan to tax big corporations like itself to pay for homeless shelters for a growing population that can’t afford the sky-high rents caused in part by Amazon. Facebook withheld evidence of Russian activity on its platform far longer than previously disclosed. When the news came to light, it employed a political opposition research firm to discredit critics. Facebook’s Mark Zuckerberg, who holds the world’s speed record for falling from one of the most admired to the most reviled people on the planet, just unveiled a plan to “encrypt” personal information from all his platforms. The new plan is likely to give Facebook even more comprehensive data about everyone. If you believe it will better guard privacy, you don’t remember Zuckerberg’s last seven promises to protect privacy. Google forced the New America Foundation, an influential think tank it helped fund, to fire researchers who were urging antitrust officials to take on Google. What to do? Some argue the tech mammoths should be regulated like utilities or common carriers, but this would put government into the impossible position of policing content and overseeing new products and services. Like the robber barons of the first Gilded Age, those of the second have amassed fortunes because of their monopolies– fortunes that give them unparalleled leverage over politicians and the economy. Some of the robber barons of the first Gilded Age were generous philanthropists, as are today’s. That didn’t excuse the damage they did to America. In this new Gilded Age, we need to respond to them as forcefully as we did the first time around. Warren’s ideas are a good start. As we suggested earlier, a Bernie/Warren ticket would be a great idea to put up against Trump in 2020. One way Amazon, for example, has been able to exert influence over politicians is through substantial campaign contributions, substantial enough so that it’s absolutely impossible to see them as anything other than bribes. Last year alone, Google and its executives poured $13,536,034 into electoral races (and that doesn’t count the $27,400,000 they spent on lobbying in the last cycle). Amazon’s biggest contribution– by far– went to the conservative-leaning With Honor Fund, which spent massively to elect Michael Waltz (R-FL), Dan Crenshaw (R-TX), Brian Mast (R-FL), Steve Watkins (R-KS), Donald Bacon (R-NE). They spent $1,744,822 on Waltz and $863,616 on Crenshaw, so we’re not talking about nominal contributions here. The only Democrats who were elected with significant help from the PAC were Jared Golden (ME), Mikie Sherrill (Blue Dog-NJ) and Gil Cisneros (New Dem-CA). Amazon was their biggest contributor– more than all other contributor combined– and their second biggest was the Bezos Family Foundation ($2,004,324).